We’re particularly pleased with this year’s calendar, launched this month. 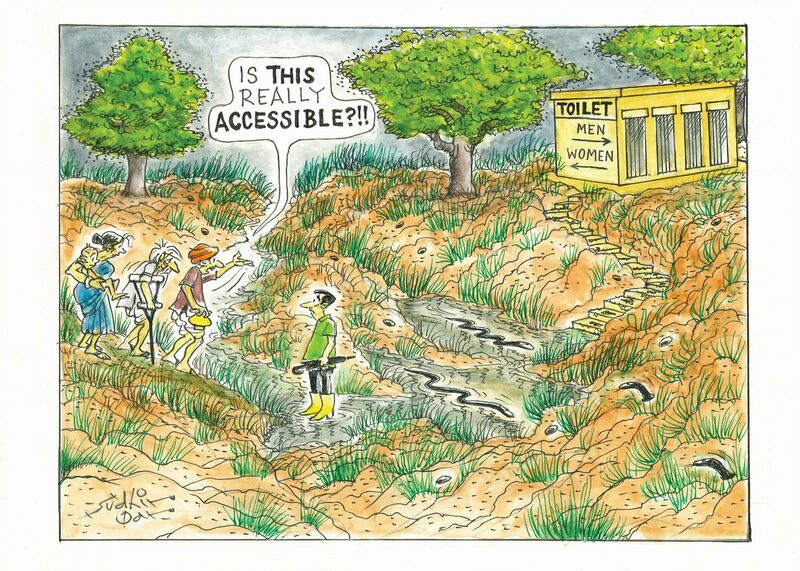 By using the medium of cartoons to raise awareness, communicate complexity, and – we hope – shift hearts and minds, the calendar can tell stories about water and sanitation in a different way to more traditional communications products. The Cartoon Calendar features different themes in different years. For 2018 and 2019, the themes mirror the five priority themes of the GWSP – sustainability, inclusion, institutions, financing, and resilience. These were identified by World Bank experts, water and sanitation practitioners, donors, civil society, and partners across the world as being essential to achieving the Sustainable Development Goals (SDGs). These five themes form the foundation for the GWSP’s mission and form the basis for the creative process for the calendar. The process begins with a facilitated brainstorming session. There’s three things that ensure this runs smoothly and productively. First, preparing some materials in advance with notable dates or events as well as common words or phrases around a key theme. This helps start the conversation. Second, ensuring there’s a diversity of expertise and perspectives in the room. This means everyone from communications staff to engineers to social development specialists – all bring their own views and skillsets. Third, the word ‘no’ is banned. Much like in improv comedy, ‘no’ tends to kill things whereas ‘yes but’ or ‘yes and’ keep the ideas flowing. Once we have some ideas on paper, we then bring in our network of talented artists. We provide them with some detailed proposals and some less fleshed-out ideas to work with. The cartoon calendar started life as a local initiative in our India country office and gradually grew into the global product it is today. And working with cartoonists from across the world remains a core part of its identity. We work with artists from South Asia, East Asia and the Pacific, Eastern and Central Europe, Sub-Saharan Africa, and many other regions. All bring their unique knowledge of their local context to their work. When first drafts and pencil sketches begin to come in, that’s where the rubber hits the road. Sometimes, a joke that seemed inspired in theory doesn’t quite work in practice. Oftentimes, our brilliant artists will devise something totally original that nobody else had considered. And almost always, seeing an early draft helps people shape and sharpen what becomes the final product. The diversity of expertise and perspectives from the people in the brainstorming session become invaluable again here as colleagues chime in with ideas on how to strengthen or clarify ideas. The hardest thing about producing the calendar is also the best thing about producing the calendar – which is how to capture nuance and complexity via images. We have some experience in this. 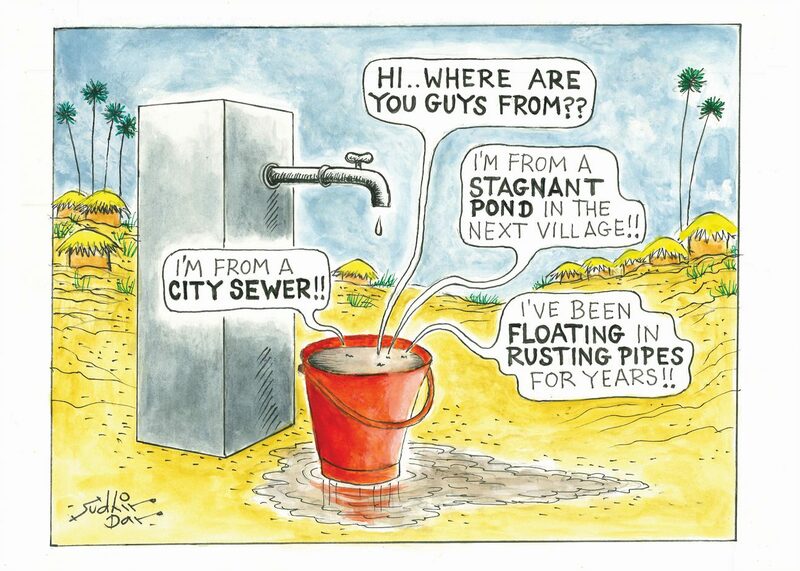 For example, for our Uncharted Waters report, we produced three accompanying cartoons that explained how the impact of an increasing number of droughts and floods impacts farms, firms, and families respectively. Water is a complex issue involving many stakeholders and it flows through and connects the SDGs. So it’s only by really owning and embracing nuance and complexity that we can do justice to the issues. 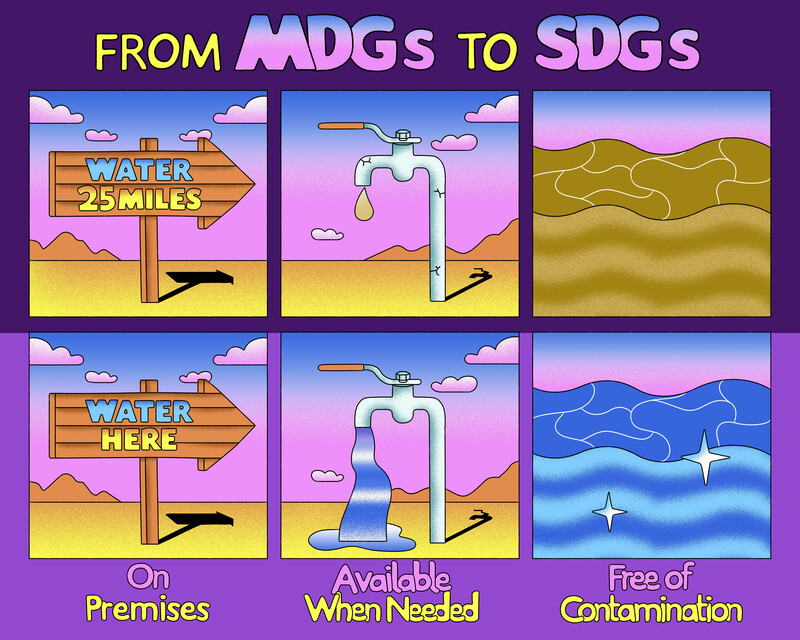 By working with our experts and artists, we’re able to visualize some of the differences between the Millennium Development Goals and SDGs, tell a story about poor water quality, and demonstrate the importance of accessibility for all, none of which are necessarily immediately intuitive or obvious. We hope the above lessons give you some insights onto what has become a beloved product of the World Bank and GWSP. A huge thanks to the talented artists from around the world who make the ideas come to life and wishing everyone a successful 2019! very useful information on water conservation. especially the images which clearly depicts the dire need for water conservation efforts in near future. may we use some of the above images on our blog https://www.jivansutra.com/ in order to spread the awareness about the importance of water among masses.